Ballet and painting. Two separate art forms, each with its own distinct and intrinsic beauty. However, what occurs when they are combined? I can only answer this question with one word: brilliance. Being a ballerina for roughly seventeen years, it is not particularly uncommon to have others take photos, record videos, or simply observe the work of my fellow dancers and me. Paint the Ballet has changed this, bringing in a whole new experience for the dancers of New Mexico Ballet Company. Being the subject of a painting is as enchanting and incredible as it seems. The most surprising, and perhaps the most interesting, aspect of this project is, in fact, the mutual excitement from both the dancers and the painters involved. Each group is so visibly overjoyed at not only showing off their talents, but also in wanting to learn about another art form. For both groups, finding a new way of viewing something proves to be one of the most rewarding outcomes. I never imagined that being drawn up on a sketchpad or seeing my likeness in water colors would ever help me gain such a strong appreciation for another art form, yet it has in every way imaginable. Perhaps it should come as no strange coincidence that this project celebrates its first anniversary in the same year as Edgar Degas’ 180th birthday. I found myself finally understanding what it was like for the dancers of the Paris Opera Ballet to be put on canvas by Degas himself all those years ago. Paint the Ballet brings out an element of dance that is so easily overlooked, it brings out the truth that each and every person visualizes ballet in a different way. This is incredibly evident as each artist is able to bring his or her own style to the exact same subject matter, bringing out magic that tends to slip by the viewpoint of the casual observer of ballet. 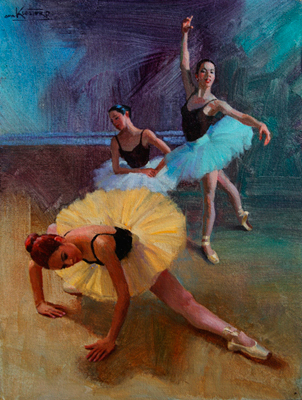 The artists of Paint the Ballet prove to be so inexplicably talented at catching details and emotions that when I saw the finished paintings at the gallery opening last fall, I was truly speechless. It is one thing for a dancer to put a great emphasis on the emotional aspect of his or her work. However, when a painter is able to place those emotions onto canvas an incredible feat is achieved. I can say with confidence that each and every one of the artists involved with Paint the Ballet would have made Degas extremely proud for continuing to show that ballet is more than just movement. Thank you for showing that art captures more than simply light and color. Thank you to all of the Paint the Ballet artists for proving that the emotions of ballet truly do not need words. And finally, thank you creating images that have a life and a magnificence all their own. It is a magnificence that cannot be stated, but must be experienced in person. See a painting of Jaclyn Younger from the Paint the Ballet Project below. Featured Painting: Backstage, by Robert Kuester, oil 14"x11"